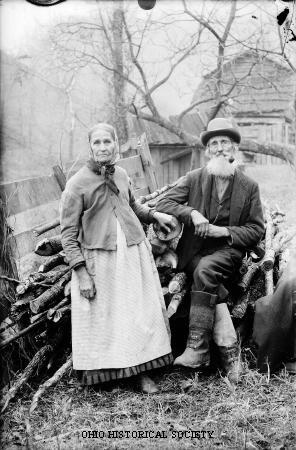 Photograph of an elderly man and woman in work clothes by traveling photographer Albert J. Ewing. The photograph was likely taken in southern Ohio or	West Virginia, ca. 1890-1910. Appalachia is a geographic region within the eastern portion of the United States. It includes all of West Virginia and parts of Alabama, Georgia, Kentucky, Maryland, Mississippi, Ohio, New York, North Carolina, Pennsylvania, South Carolina, Tennessee, and Virginia. Within these thirteen states, a total of 397 counties are Appalachia counties, encompassing almost 200,000 square miles of land and including approximately twenty million people. Twenty-nine counties in southeastern Ohio are part of Appalachia. At the start of the twenty-first century, this portion of Ohio ranks as the poorest economic region in the state. In Appalachia, the major geographic feature is the Appalachian Mountains, which run in a roughly northeast to southwest direction from New England to the American South. Much of this area is mountainous, but other parts of Appalachia include rolling foothills. The area tends to be heavily forested and rich in natural resources, especially coal, iron ore, and natural gas. There also is a tourism industry in parts of Appalachia, especially in higher elevations, where ski resorts operate during the winter months. During the late nineteenth and early twentieth centuries, Appalachia experienced an economic boom. Industrialization gripped the United States, and factories required the region's coal and iron ore. Railroads transported the raw materials to the nation's industrial centers, including northern Ohio cities, such as Akron, Cleveland, and Toledo, where the steel and eventually the automobile industries flourished. While the region experienced tremendous economic growth during this period, most of its residents did not, as the mine and other business owners usually paid poor wages and provided limited benefits to the workers.